Our Price: $149.95 ( 60% OFF ) Thinner. Lens Upgrades: Full Rimless Frames or (drill-mount) Add-On. [Add $39.95]*Select this option if your frames or glasses are full rimless only (no frame around lenses or drill mount). These frames require special lab processing. Note, Seiko lenses include premium anti-glare (AR). Half Rimless Frames or (No Frame/Wired Bottom) Add-On. [Add $15.95]*Select this option if your frames or glasses are half rimless (Seiko lenses include anti-glare AR). 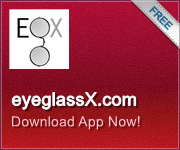 *Note, if you have any questions, email or call us (info@eyeglassx.com). Available Rx: -10.00 to +6.00. For cylinder greater than +/- 2.00, there may be an add-on charge. Your pupillary distance (PD), is the measurement from the center of one pupil to the center of the other (in millimeters). This is the only other measurement needed (along with your prescription). Ask your eye care professional if necessary. Our Price: $189.95 ( 65% OFF ) Thinnest! Have used this site for multiple sets of glasses over the last 2 years, and I have been impressed with the quality of their work. Not only do they do excellent work, but their customer service is truly personalized. They kept me updated with their progress and took the time to contact me both by phone and email to clarify a point. Awesome business! I checked around and this website service had the best pricing on Seiko hi index lenses. Plus the price included anti glare lens coating which I have paid $85 dollars for in the past plus the lenses.